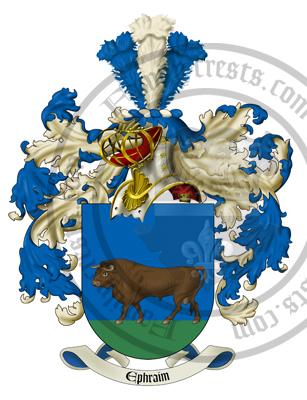 Surname: Ephraim (D115061) To order this coat of arms enter the Surname and number as shown into the order page when asked for a surname. History: Mainly Jewish: from the Biblical name, which is probably from a Hebrew word meaning 'fruitful'. In Genesis 41:52, Ephraim is one of the sons of Joseph and the founder of one of the twelve tribes of Israel.